I have long wanted to attend MCG’s annual conference. This year, as a very grateful bursary recipient, I was able to experience it for the first time. The sheer amount of delegates packed into the Imperial War Museum’s conference suite is a testament to the strength of the programme and the timeliness of the theme, ‘Museums and tech in a divided world’. For me, the superb keynote and range of expertly delivered presentations combined to ask some big and difficult questions. But these are questions that need to be answered for museums to remain relevant in tumultuous times. The first session, Museums in a post-truth world of fake news asked; how can museums retain their status as ‘trusted’ institutions? And the following discussion between delegates raised what I think is an incredibly important question; is there a need for museums to be more transparent about their editorial processes? 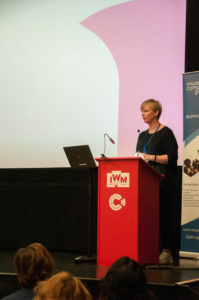 In the following session Challenging expectations, Alexandra Reynolds, Postdoctoral Research Fellow, Southampton Solent University, asked how digital technologies might be or can be used to challenge the museum’s traditional relationship to power structures drawing upon the example of #museumsrespondtoferguson. The third and fourth sessions looked at how museums are responding to some of these questions, particularly in their attempts to increase access through use of digital tools and techniques. From the use of a chatbot at the Anne Frank House to Rafie Cecilia’s experience of using technology as empowerment tools for visually impaired visitors, delegates were able to see the practical measures that have been implemented across a range of museums. Finally, throughout the day many speakers touched upon the use of volunteers in their projects. In her keynote, Hannah Fox of Derby Silk Mill related her experience of truly co-producing the beginnings of the Museum of Making with the people of Derby. This effort has benefitted from over £400,000 worth of volunteer hours. Abira Hussein, Transforming Archives Trainee, in her post-lunch provocation spoke of the need to democratise museums and the fact that the current volunteer culture proves to be a major stumbling block in this endeavour. With the circulation of a survey focused upon volunteering, our minds were very much focussed on how the sector might improve its approach in the future. The strength of this conference was undoubtedly how openly delegates, speakers and MGC committee members spoke of their experiences and challenged each other to think about how to really and practically answer the many questions posed. In fact, the day ended with Ross Parry’s announcement of a new project, ‘One by One’. 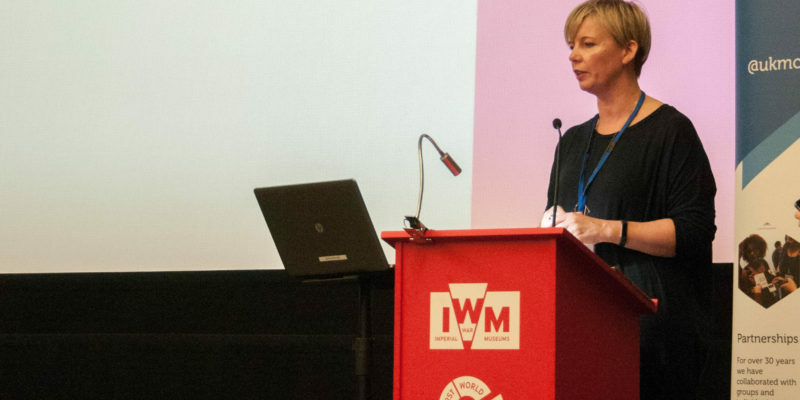 This ambitious undertaking aims to build digital literacy in museums across the United Kingdom, an aspiration that can only have widespread benefits for the museums sector and our visitors. Posted in Events by Brian on December 14th, 2017.